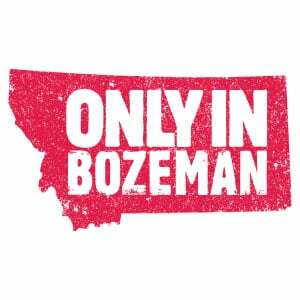 Bozeman has an extensive amount of trails and recreational opporunities in the surrounding moutains and even here in town. In the winter, these trails transform into great places to go snowshoeing or cross country skiing. Exploring these snow covered trails give you a completely different perspective than hiking them in the winter, and the snowshoeing in Bozeman is phenomenal. Here are 5 places for you to get out and try out those snowshoes this winter. 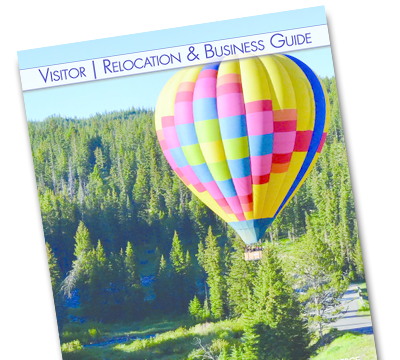 Bohart Ranch sits in the beautiful Bridger Canyon below the rugged Bridger Mountain Range. It bolsters just under 20 miles of scenic trail systems located on both private and Forest Service terrain. Take your pick of trails through a variety of terrains, such as open meadows or deep forests with stunning views of the Bridger Mountains. Trails are well suited to all levels of ability. If you're a beginner, Bohart Ranch would be a great place to start your snowshoeing adventures. First of all, they offer snowshoe rentals if you don't have your own. In addition, snowshoeing might seem relatively straightforward but it is important for you to get comfortable on moderate terrain before you move to challenging terrain to see more of the beautiful sights. Bohart Ranch offers lessons anytime during the day with their trained, knowledgeable, and friendly staff. Directions to Bohart Ranch: From I-90 take the Main Street exit to downtown Bozeman. After approximately one mile turn right onto Rouse Avenue North. Rouse Avenue becomes Bridger Canyon Road (Hwy 86.) Continue 16.6 miles up Bridger Canyon. Bohart Ranch Cross Country Ski Center is just past mile marker 16 on your left. Chestnut Mountain Trail is relatively unknown. It's a little off the beaten path which has its perks; it's pretty quiet and isn't packed most days. The trail is wide with a moderate incline for 4.6 miles to 2,200 feet, which makes it perfect for a group of individuals just starting out. It was created by the Gallatin Valley Land Trust in an effort to connect trail users to public land and providing more access to explore the amazing area in and around Bozeman. Directions to Chestnut Mountain Trail: From Bozeman, drive east on I-90 towards Bozeman Pass. Take the Trail Creek exit and head east on Trail Creek Road. The trailhead parking is on the south side of the road, roughly 200 yards from the interstate exit. Sourdough Canyon Trail, also referred to as the Bozeman Creek Trail, is a regularly groomed trail section thanks to the Bridger Ski Foundation Nordic. This old logging trail is located in Bozeman and is roughly 5 miles at the cutoff, or continue on another 5 miles of more difficult terrain to arrive at the Mystic Lake Trail. This is considered a more of a walking trail than a hiking trail but is nonetheless a great place to go snowshoeing in Bozeman with a moderate grate making it easy for snowshoers of all ability levels. Directions to Sourdough Canyon Trail: From Bozeman, head south of Church Avenue. As you cross Kagy, Church will become Sourdough Road. Continue south until you reach Nash Road. Turn right and head west on Nash. The first road on your left will be Sourdough Canyon Road which dead ends into the Sourdough Canyon Trailhead. There are infinite possibilities for exploring Hyalite on snowshoes including several great trailheads around Hyalite Reservoir, but our standout is Hyalite Peak. The trail is about 16 miles round-trip with an elevation gain of 3,400 feet to the summit. The real treasures of this hike are the numerous waterfalls along the way. You don't have to go all the way to Hyalite Lake to see them. The first, Grotto Falls is only a short hike in and is a very moderate grade, easy for all ability levels. Keep your eye out, you might get to watch some ice climbers making their way up nine more beautiful frozen waterfalls. Head in as far as you feel comfortable and turn around and head back to the trailhead. Directions to Hyalite Lake / Peak: From Main Street in Bozeman, take South 19th for 7 miles to the signed road for Hyalite Canyon. 11.5 miles up the canyon, shortly after the road passes Hyalite Reservoir and becomes unpaved, a signed junction indicates that you go right for the Hyalite Creek Trail. Follow this road for 2 miles to a large parking area at the trailhead. Nestled within the Gallatin National Forest, the volcanic peak of Mount Blackmore stands just west of Hyalite Reservoir. Blackmore Lake lies below the peak and is a more challenging hike with a 650 foot gain in elevation. The trail to Blackmore Lake is accessible via the Mount Blackmore trailhead right before you get to the reservoir. This is a relatively popular trail used by locals and tourists alike and you will often find backcountry skiers descending down the trail after skiing the basin between Mount Blackmore and Elephant Mountain. After the lake, the trail continues up to Mount Blackmore so more adventurous snowshoers can head further up the mountain to explore the wilderness. Directions to Blackmore Lake: Departing from Bozeman, Montana, at Main Street and 19th Street, you will take 19th Street headed south and then west out of town, passing by Montana State University. 19th Street will become South 19th Road. Follow this for approximately 7 miles until you reach the turn to Hyalite Canyon. Make a left hand turn onto Hyalite Canyon Road and continue for approximately 10 miles to the trailhead. The trailhead is located immediately on the right side of the road, just prior to the dam for Hyalite Reservoir. There is a small, gravel parking lot and the trailhead is well marked. As a reminder, whether following marked or even unmarked cross country ski trails, please be aware of trail etiquette and avoid walking or snowshoeing on the ski tracks set by the groomer or by other skiers. And always, hike with a partner. There are many unforeseen risks when exploring Montana's backcountry so please snowshoe with caution. 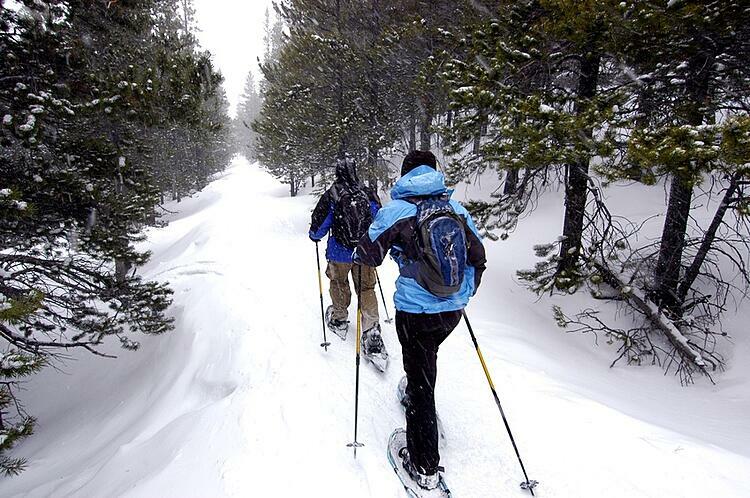 Snowshoeing is a great way to experience the winter in Bozeman but be sure to pack accordingly.